Now there is at Jerusalem a pond, called Probatica, which in Hebrew is named Bethsaida, having five porches. In these lay a great multitude of sick, of blind, of lame, of withered; waiting for the moving of the water. And an angel of the Lord descended at certain times into the pond; and the water was moved. And he that went down first into the pond after the motion of the water, was made whole, of whatsoever infirmity he lay under. And there was a certain man there, that had been eight and thirty years under his infirmity. Him when Jesus had seen lying, and knew that he had been now a long time, He saith to him: Wilt thou be made whole? The infirm man answered him: Sir, I have no man, when the water is troubled, to put me into the pond. For whilst I am coming, another goeth down before me. Jesus saith to him: Arise, take up thy bed, and walk. And immediately the man was made whole: and he took up his bed, and walked. Some of the best emails I receive are the “I went to confession!” emails. Some are first time ever, some are after decades and decades away from the Church. The Pool of Bethesda is a figure or foreshadowing of the Sacrament of Penance (Confession). Now, instead of every once in a while, and to only one person at a time, Our Lord makes healing available to everyone, all the time. The Pool is open for “free swim”, and St. Raphael the Archangel is splashing about like an eight year old boy after a lunch of Oreos and Dr. Pepper. So jump in! Go to confession! The Gospel of today tells of the cure of the infirm man who had waited 38 years at the Probatica pool—a figure of the Sacrament of Penance. How was his cure wrought? First of all, the infirm man says to Jesus: I have no man, when the water is troubled, to put me into the pond. The water would have cured him; but observe, he has need of some Man to lead him to the water. This Man is the Son of God, and He became Man in order to heal us. As Man, He has received power to forgive sins, and before leaving this earth, He gave that same power to other men, and said to them: Whose sins ye shall forgive, they are forgiven them (John 20: 23). The penitents, then, are to be reconciled with God by virtue of this supernatural power; and the infirm man, who takes up his bed and walks, is a figure of the sinner, whose sins have been forgiven him by the Church, by the divine power of the keys. In the third century, a heretic named Novatian taught that the Church has not the power to forgive sins committed after Baptism. 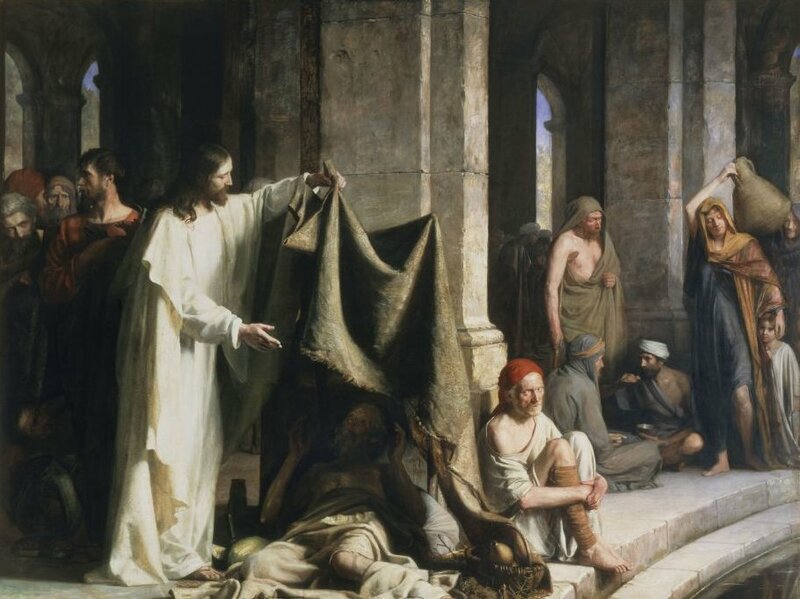 This doctrine was condemned by the Councils and the holy Doctors of the Church; and in order to offer to the faithful some outward expression of the power given to the Son of Man of forgiving sins to such as repent, there was painted on the walls of the places where the Christians used to assemble, the infirm man of the Gospel, walking with his bed upon his shoulders. This consoling symbol is frequently met with in the frescoes which were painted, even in the age of the Martyrs, in the Roman catacombs. They show us how the early Christians were taught to understand this passage of the Gospel, which the Church, so many centuries ago, assigned to this day. The Water of the Probatica was also a symbol; and here the Gospel conveyed a special instruction to the Catechumens. It was by Water that they were to be made whole, and by Water endowed with a supernatural virtue. The miraculous pond of Jerusalem could only cure the body, and that at rare intervals, and the favor could only be conferred upon a single individual; but now that the Angel of the Great Counsel has come down from Heaven and sanctified the waters of the Jordan, the Probatica is everywhere— it is giving health to the souls of man without any limitation either of time or number. Man is the minister of this grace; but it is the Son of God, become the Son of Man, that works by the human minister. Let us also consider the multitude of sick, who, as the Gospel tells us, were waiting for the moving of the water. They represent the various classes of sinners, who are seeking, during this holy time, to be converted to their God. There are the Sick, or as the Latin word has it, the Languid—these are the torpid, who never thoroughly give up their evil habits; there are the Blind—these are they whose spiritual eye is dead; there are the Lame—who limp and falter in the path to salvation; and lastly there are the Withered—who seem incapable of doing a single good action. All are waiting for the favorable moment. Jesus will soon be with them, and will say to each of them: Wilt thou be made whole? Let them answer this question with love and confidence, and they will be healed. This entry was posted in Uncategorized on October 24, ARSH 2014 by Ann Barnhardt.